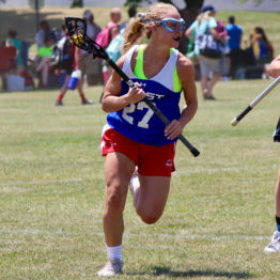 Congratulations to Blast 2019 Blue and Spring-Ford defender, Michaela Haney, on her commitment to the admissions process at The University of Pennsylvania! UPenn is located in the heart of Philadelphia and as a member of the Ivy League, the Red & Blue “Quakers” compete against Harvard, Yale, Dartmouth, Princeton, Cornell, Brown, and Columbia. Last season (Spring 2016), Penn won the Ivy League Championship (regular season, 9th time in 10 years) and also made an appearance in the NCAA Quarterfinals against Penn State. Michaela has been a member of Philly Blast for just over one year (Fall 2015) after transferring from another local club. “My favorite part of playing Philly Blast Lacrosse is the coaching style and how much time the coaches put into every player.” Outside of Philly Blast, Michaela also competed on a Philly Team for National Tournament (2016), Varsity Field Hockey and earned Honor Roll at Spring-Ford. Read Michaela’s full commitment story HERE.